The Dutch defender, one of the new arrivals this summer, says that "I am very happy to be playing for Barça Women"
Stefanie Van der Gragt is one of the most experienced players in the Barça Women squad, having enjoyed success with several European sides. The move to the Catalan capital this summer is a new challenge for the Dutch player, who spoke on the team's tour of the USA this week. “It's a dream come true. Barça are the best club in the world, and I'm very happy to be here," she explained. Van der Gragt signed for the club on 4 June, and is still getting familiar with the setup. "I'm a little shy at the moment, because I still don't know people. I have played with Lieke Martens in the Dutch national team for the past 12 years. We've played at every age level, and were part of the side that won the European Championships in 2017. She's spoken very highly of Barça Women." 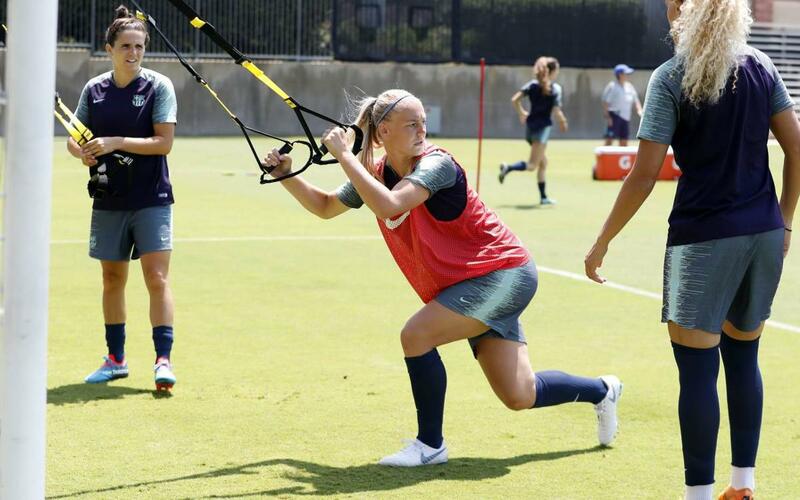 The visit to the U.S. -the first mixed tour in Barça history- has allowed Van der Gragt to see some of her idols up close. However, her favourite is one that she will have to wait to meet: Gerard Piqué.